Penny Arcade has announced God of War director Cory Barlog will deliver a “Storytime” keynote at PAX South 2019. During the talk, Barlog will discuss his prolific career in the industry, which spans approximately two decades. After joining Sony in 2003, Barlog served as lead animator on the original God of War. He then went on to write and direct God of War II, for which he won a BAFTA award for writing. After God of War II, he stayed with the franchise, contributing as both writer and Creative Director on installments such as God of War: Chains of Olympus and God of War: Ghost of Sparta. Barlog parted ways with Sony in 2009 for spells at LucasArts, Crystal Dynamics, and other ventures. He would return to Sony in 2013 to helm the latest entry in the God of War series, which released earlier this year to near-universal acclaim. 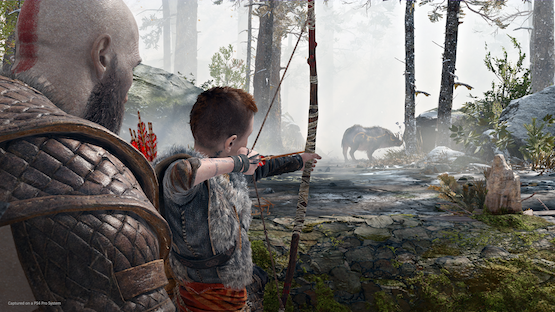 The meteoric success of God of War deserves endless praise. Cory Barlog and his incredible team at Santa Monica Studio are, of course, central to the franchise’s acclaimed return. Since before the title’s April 2018 launch, Barlog has been outspoken about what this entry means to him and the development team. Previous talks given by Barlog have revealed astonishing details about the final versions of games. At Devcom 2018, the director divulged that Atreus was nearly cut from the experience several times. During God of War’s San Diego Comic-Con 2018 panel, Barlog detailed how he initially pitched “Dad Bod” Kratos. Thankfully, his relaying such information won’t soon come to an end. PAX South 2019 begins on January 18th and ends January 20th. It will be held in the Henry B. Gonzalez Convention Center in San Antonio, Texas.